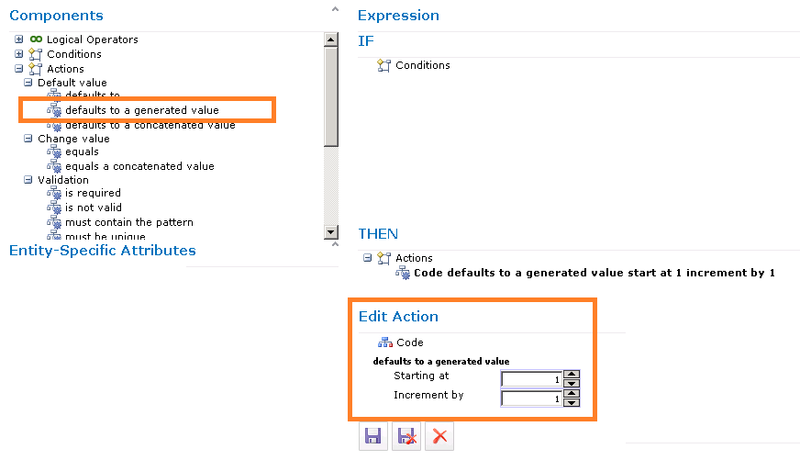 MDS auto-generated Code value – how to import new members via staging tables? Creating the business rule is straightforward but problems start when it comes to importing data via staging tables. Recently I had to set up an entity that had to have an unique code across the enterprise. In SQL Server 2012 version of MDS this is achieved quite easily just by checking the “Create Code values automatically” checkbox when creating the entity. In 2008 R2 version we have to leverage the business rules feature. Action “defaults to a generated value” comes handy. First, create a new business rule and choose the “defaults to a generated value” action and drag Code-attribute into the “Edit action”-section. Starting the incremental generation from number 1 is fine. Now we are ready. At least if we only use MDS web user interface to add new members to our entity. In my case I need to import the data from source system(s) and therefore I need to use staging tables. 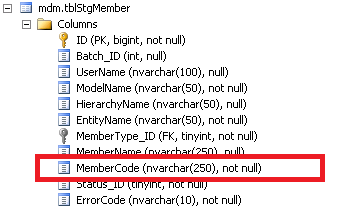 One can not insert NULL values into the MemberCode column. First of all, how the hell I’m supposed to insert any new members into the staging table since the MemberCode-column is not nullable? Luckily I found this MSDN Forum Thread where I was told to assign the legendary “” – empty string value to MemberCode. OK, works out well but the problem is that I also want to import some additional attributes (other than the mandatory Name and Code attributes) via tblStgMemberAttribute-table and there I need to have the unique MemberCode that is assigned after the model is validated or the business rules are executed. How am I supposed to assign the correct attributes to correct member if I don’t know the unique MemberCode because it’s generated after the model is validated? Now what? How to import additional attribute values if we don’t know the Code value when importing? Special “#SYS-“-prefixed GUID Codes are assigned to members that were imported with empty string as membercode. These “#SYS-“-prefixed GUID values are only temporary because when the business rules are executed MDS replaces them with the value that we have set when defining the business rule. So how does this help us since the #SYS-values are still assigned AFTER the import and we need them BEFORE we import the rows via tblStgMemberAttribute-table? We simply “emulate” the MDS’s internal process by assigning the system guids by ourselves already in the loading phase by generating the unique system guids for example using the newid()-function in SQL Server. Generating the #SYS GUID on our own by newid() function call. Now, by assigning the system GUID ourselves to the tblStgMember and tblStgMemberAttribute tables we can successfully import new members with additional attributes and get the correct auto-generated code values by validating the model. This entry was posted on Tuesday, January 15th, 2013 at 10:58	and tagged with auto-generate, auto-generated code, business rule, master data services, mds, staging table and posted in Master Data Services. You can follow any responses to this entry through the RSS 2.0 feed.